This verse is one of my favorites, and its message stands for itself. 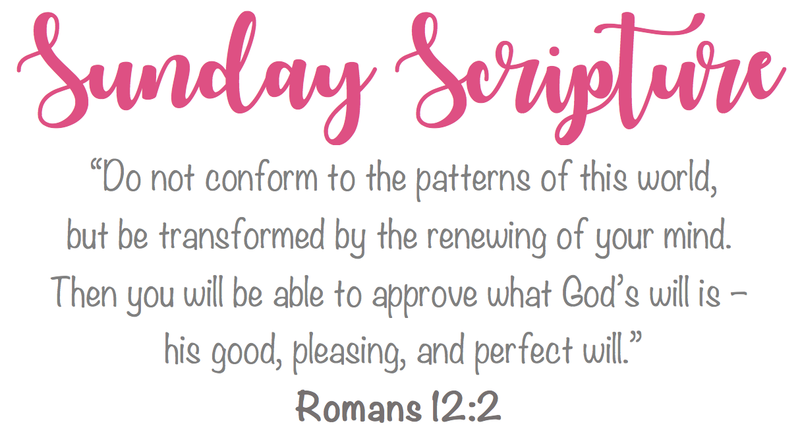 There are definitely more “patterns of this world” I do not want to follow than ones I do want to follow… I’d much rather follow the patterns of Jesus. I’d rather let my mind be transformed by God than by this world. The influences from the world are heavy in high school, and they only get heavier in college. We’re trying to figure out who we are, and it makes us even more susceptible to let ourselves be filled, shaped, and molded by worldly things. While I’m in this state where I can be so easily influenced, I feel like I’m shaped by how I spend my time. Do I want to spend my precious minutes worrying over whether I fit the mold of a person that the world seems to prize? Or would I rather spend my time praying about how I can become the person I was created to be? Okay, that’s an easy one, but the right answer is not always easy to choose. I’d rather be getting to know Jesus and who He has made me to be, instead of giving in to who the world thinks I should be. I’d rather be living in a Godly world, than in worldly goods. I’d rather be working towards higher graces than lower pleasures. I’d rather look towards Jesus for who I want to be. I’m not saying that there’s no balance, and I’m not saying that I am not at all influenced by the world around me, it would be impossible not to be. I’m just saying that (like I talked about in this Sunday Scripture) we are made for the light, not the darkness. The influence of the world is always there. You don’t exactly choose to be surrounded by it, but that doesn’t mean you have to give in to it. You may not always feel like you are as surrounded by God’s grace, but you can choose how much you let him in. I’d rather make the choice to follow God’s will, and I know it’ll be much better than the will of the world. Kristen, I only wish more young people would think like you. It really does my heart good to see that your good Christian upbringing has you thinking like Jesus would want you to. Keep up the good work and continue to follow your heart.